The Hyundai Tucson is somewhat strange to look at. It looks like it’s Godzilla on wheels yet it looks too tiny to be Godgira. For a giant, extinct creature, it’s remarkably comfortable to drive. I’ve driven one and I can say that it’s not that bad. Before I start ranting, I’d like to say that this is not the sister to the Kia Sportage. 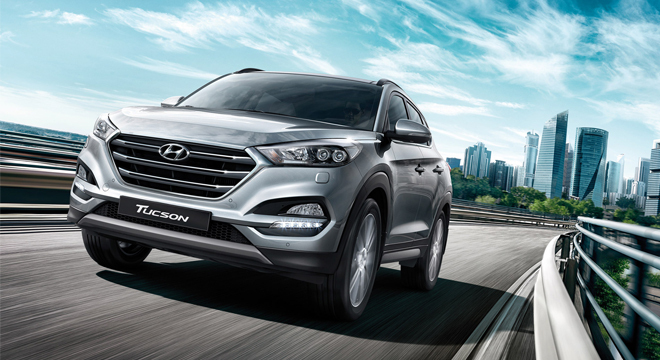 Unlike the Sorento and Santa Fe that are built in the same factory, the Tucson and Sportage are separate. Now, then, to the bat-terior! It’s rather comfortable in here. Think of it like driving around in a Honda but with a Hyundai badge. Oh, and look! There’s also a touchscreen infotainment system that looks like it’s from an Android or iOS Bluetooth controller. Also, the interior is, despite not being sister cars, surprisingly and remarkably similar to the Sportage. It’s almost like dating twins in here. There’s even a USB and Bluetooth connectivity for those of you who make calls on the go and if you order higher end models, back up cameras and parking sensors are in your range. Like with the Sportage, however, wading is quite questionable let alone it’s off-road capability. But 99% of it’s owners aren’t gonna take it off road anyway so why bother? The driving’s not bad either. Even though this thing rides nearly twice as high as most sedans, it can take corners remarkably well; almost as good as a sedan and it’s got plenty of power too. Also, it’s quite deafening in here. I mean literally. It’s so silent in here, I can hear my hair growing; hardly a hint of noise. It makes you feel like you’re driving a Lexus. And it comes with many seats as well so nuclear powered kids (or adults) are accepted. Of course, it’s going to cost a pretty penny. At PHP 1.1 to 1.7 Million, it’s either an expensive bargain or a panic buy.